Since the figure skating teams events wrapped up this Sunday at the Winter Olympics at PyeongChang, all eyes are now on the individual figure skating events. 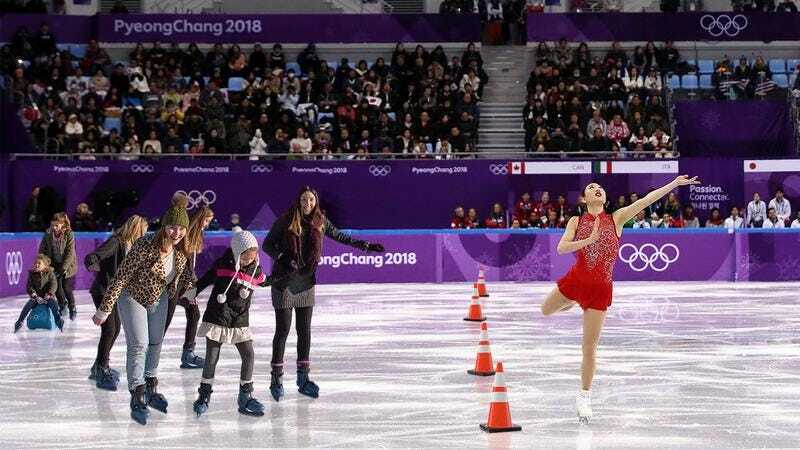 However, with those competitions fast approaching, an unexpected scheduling error threw last night’s competition into chaos: The short program for women’s figure skating was forced to share the Olympic rink after being double-booked with a 7-year-old’s ice skating birthday party. Wow. For athletes who have trained their whole lives for this moment, this must be absolutely devastating. Just moments before the Olympic skaters took the ice for the women’s singles skating program, representatives of the International Olympic Committee announced that the competition would take place concurrently with the seventh birthday party of Columbus, Ohio resident Ethan Dunn. Ethan’s party included 20 of his closest friends, thus ensuring that the world’s top figure skaters had no choice but to perform the most important routines of their lives on an ice rink full of children. Wow, kudos to all 30 athletes who participated in the short-form event last night for handling this extra obstacle. Hopefully, the next time someone’s mom decides to put down a deposit for a skate-themed birthday party, the IOC will make sure that it doesn’t conflict with the Winter Olympics’ most beloved sport!